Moscow, June 2, Interfax - Orthodox believers held a large-scale action in Moscow on the occasion of the International Day of Protecting Children. Representatives of association of youth Orthodox movements Georgiyevtsy! a dance flashmob aimed against homosexual propaganda. 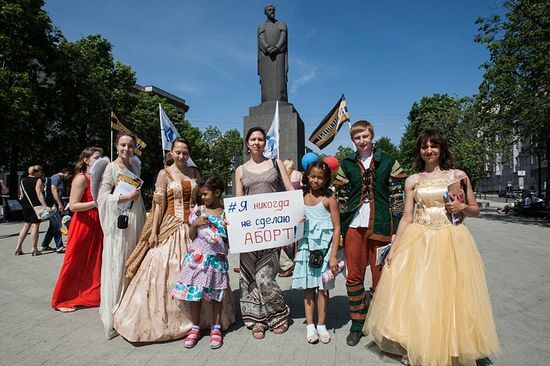 Young men and girls dressed as Cinderella and Prince, Romeo and Juliet, d’Artagnan and Constance and other famous lovers from novels and fairy-tails marched along the streets in the city center with slogans and balloons dancing historical dances and reading extracts from literature. One of the brightest moments of the flashmob was an appearance of the slogan when literary heroes stood in a line and each of them took out a placard with a letter printed on it, letters made words: “we’re against gay pride.” Many people made photos with the slogan. The main idea of the flashmob is a call for beautiful and healthy relations between man and woman and traditional family.